This is another ‘collaboration’ beer, a friend from BFD brews a fair number of saisons, belgians, and sours. So we’ve emailed back and forth quite a bit discussing brewing a saison together, with the idea of splitting a 10g batch. I just haven been able to to sneak away for that large of a chunk of time. Instead of splitting a batch, I decide to brew solo, and will bring the results to a club meeting. Seem familiar? I had most of the ingredients for the recipe, but as usual I was missing a few. I had to swap out candy sugar for some wild flower honey. The major diversion from the recipe is the aroma hop, the recipe called for dose of the noble hop Saaz. I swapped it out for bullion which is anything but noble. On an amusing note (to me at least) this is the first recipe I’ve come across with both Saaz and Citra, which are names of our two cats. Since I was missing Saaz, I decided to name it missing cat saison. So maybe next time I’ll stick to the recipe and call it two cat saison. My brew night was mostly uneventful. When I went to heat my strike water, I found my thermometer was busted. Good thing I had a backup. Unfortunately the backup is not very well calibrated. My oldest helped me measure out the grain and cheered me on while I cranked away on the mill. Pretty funny when she was saying daddy you can do it! This is the first time I can say I only made a few minor tweaks to my brewing process, rather than wholesale changes. It’s nice to get to the point where I have a semi stable brewing process. First tweak was take strike temp inside my cooler instead of in the hlt. This made a huge difference in being ably to hit my infusion temp. I hit 150. Next minor change was to add a hose to my out spigot, to limit hot side aeration. I figure the big guys all talk about it, I might as well take a simple step to limit it. To be honest the rest of the brew night is a bit of a blur and uneventful. 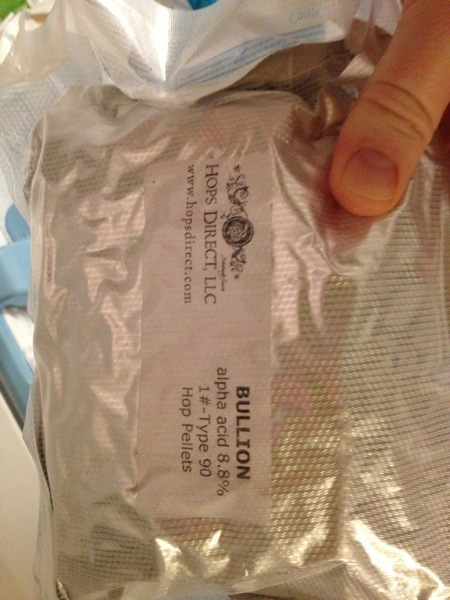 The only issue was transferring from kettle to primary, the combo of whole hops and pellets is just a disaster. I am thinking I’ll add a false bottom to my kettle, and hope it works. Hopefully I will be able to get beyond my whole cone issues. I’m beginning to think I’m alone using a lot of whole and pellet hops, and I should get off the fence and use one or the other. But I’ve got such a stock pile of both I need to figure out a compromise. 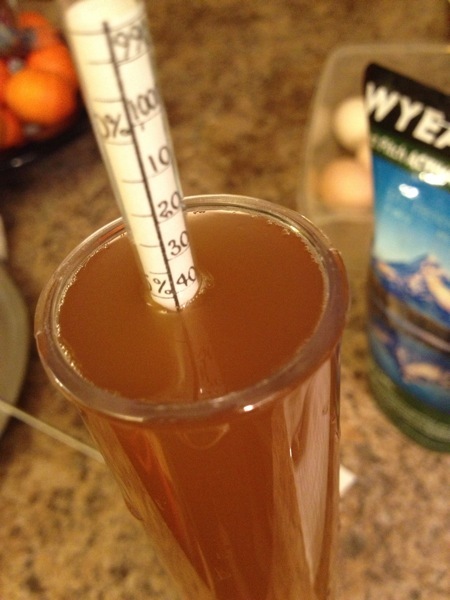 My OG was 1060, I collected just over 5g in the fermentor and pitched 3711. It took off and bubbled for a while while I was slowing cranking it from the 65 pitch temp to 74. I have not taken a gravity but it’s been 9 days, and I’m guessing it’s darn near terminal. 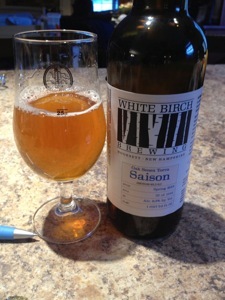 This is my first saison and I’m kinda psyched. It’s a style I feel very close to. My family is french canadian, and having a small farm I like the idea of a farm house ale. This is the recipe / beer that inspired me to use Bullion as the aroma hop, thinking outside the box. 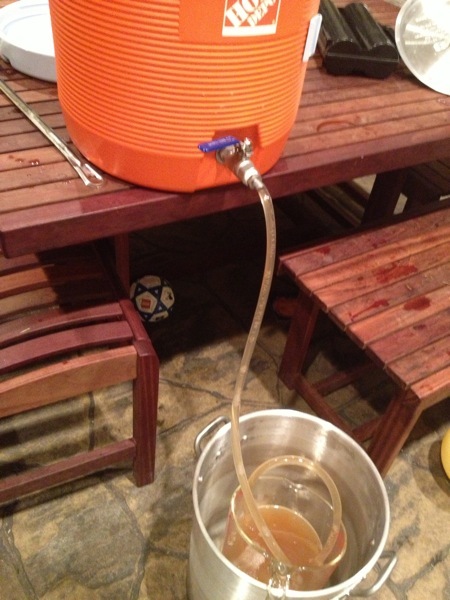 Chris Lewy using belma in a saison. Nice write-up. I should mention, though, that my first Saison wasn’t a Dupont clone… it was just a spring Saison recipe I found in Zymurgy. Thanks, Total brain fart there, I was rereading my link notes way too late last night. Fixed. Long delayed Chat Absent tasting notes Brewing Log: Rye Saison with wild dregs. Duo Brew Day Mild brew night with friends It’s a brew party and third time is a charm?